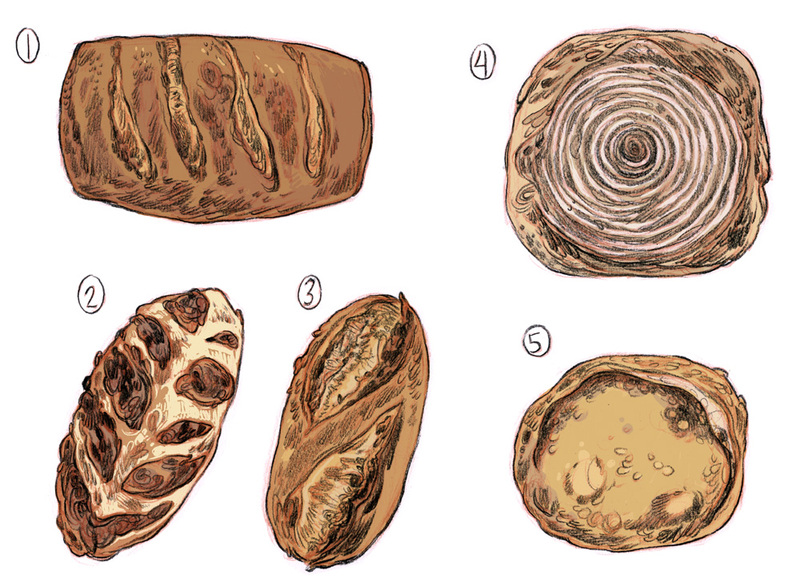 Some while back, a commenter challenged me to list my four favourite breads. Now, after much hardship and personal sacrifice, I have chosen five (one more for the cheap seats). Having prepared this list, I’ve also decided that I should add a Vancouver section to Hchom, keeping track of my favourite bakeries/restaurants/whathaveyou. Ideally, it might be of use to somebody visiting or living in Vancouver. At the very least, it gives my obsessive documentation of baked goods some kind of official sanction. 1. Whole Wheat from Baguette and Co. They actually no longer make my real favourite, which was called “Ancient Grains Bread”, dense and dark and perfect. But this is also excellent, and versatile. Everything at Baguette and co. is extremely tasty. If I had to nominate an enduring favourite from the list, this might be it. It’s like a Bran Brack, so thick with raisins and nuts it’s nearly fruitcake. Best buttered toast ever. This bread is my traditional choice for leftover roasted-bird sandwiches. It’s my Old Reliable. I’m also very fond of the Peasant Bread, here. Dense, hearty stuff. Good fantasy adventure stock. It must be evident by now that I’m partial to a dark, nut/fruit sort of thing. This makes for nice buttered toast with marmalade. Here here! I would add my honorable mentions to the list: Green Olive from Terra Breads, it is a great snack bread, as well as French Bread from A Bread Affair, perfect for sharing! What is this… sharing you speak of? I was reading an article about the cancellation of Northlanders, and they mentioned that there’s going to be an issue drawn by you ! i think the peasants are trying to signal some great event! there’s crop circles in their bread!! YESSS!! I love these food art, next one should be drinks. Also, I’m trying to find coffee in Vancouver that’s as good as CREMA. I have to plan my attack, for when you visit. Your blog consistently amazes me. Your drawing of #3 is the most delicious thing I’ve ever seen. Thank you! It is even more delicious in person, I assure you. So many cozy island mornings-afternoons with #2 + cold unsalted butter + endlesscupsoftea. Fresh cold sheets waiting for a pre-dinner nap, a warrior to level up on a portable gaming device, a salty dog snoozing somewhere nearby. Can you guys move back to Vancouver now? And then let’s all buy cabins, and live this day OVER AND OVER AND OVER AND OVER AGAIN. I know. I KNOW. Snoozy be coozy. So un-re-creatable in Ontario. They have “cottages” here. On lakes. With slimy rocks. No fresh ocean breezes. It’s a freshoceanbreeze-free zone. You are a fantastic illustrator, Ms. Churchland. I never imagined that someone could draw bread so well so…regularly (since they seem to crop up in a lot of your posts), and with such specific differentiating detail. I am a bread-lover myself, and not too artistic; I find it hard to visualize the little things that can differentiate one bread from another. But, this post of yours… Wow. I am amazed :) I’ll definitely follow your future posts.